In 1894 the Wisconsin-Michigan Railroad first crossed the Menominee River from Wisconsin into Michigan's upper peninsula. Investors knew there was money to be made by harvesting lumber further inland and the railroad was the easiest way because automobiles were not yet invented. The railroad brought many workers into the area some of which were loggers, merchants, and farmers. Small communities grew up along the railroad and one of these rural communities was Longrie. The name originated from the Longrie family as it was John and Eva Longrie who owned much of the land in the area. They also owned the general store which served as a train station. The train didn’t stop every day, but only when needed. A person with a flag would ‘flag’ down the train and they would stop. Longrie wasn’t much of a town compared with towns of today. It consisted of only a few farms, a blacksmith shop, the general store, and a cedar yard where lumber was stored for shipment to the big cities. As more and more people moved into the area the Longrie community grew. Education was important and the township of Lake, created in 1910, recognized the need for additional schools. There were other schools in the area but the walking distance was too far. So in 1911 the widow Eva Longrie (John Longrie died in 1904) deeded an acre of land for the school and by fall the building was complete. This was the first Longrie School. It would last until late 1929 when it caught fire and burned to the ground. It was thought that sparks from a passing train set fire to the roof but more than not it was the result of a chimney fire from built-up creosote in the chimney lining or some other furnace related malady. For the next few months the children attended a 'make-shift' school in a portion of the Robert Kruhmin Sr. home which was formerly the Longrie general store and train station. It was located on S-4 road and succumbed to fire itself in 1935, three years prior to the Wisconsin Michigan Railroad ceasing operations. Robert Kruhmin Jr., better known as 'Bobby' and a toddler at the time, was likely the youngest 'student' in the class. He was on several occasions found crawling on the floor amongst the feet of others during class. 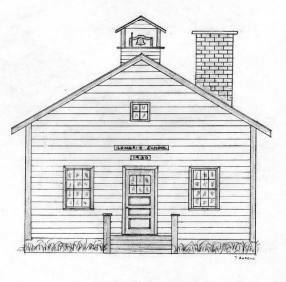 E.F. Potter of Stephenson received the 'low bid' of $1993 for construction of the new 24' x 38' school. This is the same building that remains to this day. Just to the east of the school stood a 16' x 20' woodshed that housed the coal and wood for fueling the school furnace. The original woodshed was replaced by a new woodshed constructed further to the northeast and is the same size as the original. In general, it was constructed to replicate the former as much as possible and practical. Schools in the old days were not separated into classrooms like they are today. All the students sat in one big room with only one teacher for all the students. School size at Longrie varied from 17 to over 30 kids with a few in each class. School age children were usually between six and 18 so the teacher would teach one age group at a time. The younger pupils would often learn while listening to what was being taught to their older siblings. Pupils were assigned duties such as cleaning erasers, sweeping the floor, erasing the blackboard, and hauling in firewood and coal for the furnace. Teachers often paid a students who lived close by $2.50 per month to light the furnace each morning. That way it would be warm when the teacher and the other students arrived. Drinking water came from an old hand pump out front that still works today. Often times a pupil would be assigned the task of keeping the water crock filled up. Water was dipped from the crock and everyone drank from the same dipper. Many children got sick this way and missed out on school. Others had to help out on the farm. Pupils carried their lunch in an old lard or peanut butter pail. They often warmed the food on the furnace in the winter along with drying out wet winter hats and mittens. Those lucky enough to live close by ran home for a hot lunch every day. Often times parents would take turns and each day a different parent would bring a hot lunch of some sort for all to share. Other times pupils would simply trade lunch items between themselves. Teachers usually lived with a family that was near the school until cars became more prevalent. These living arrangements were normally made by the town supervisor. The teachers paid the host family money to live with them out of their meager earnings which in 1912 was only $35 per month. Weekends would give the teachers a needed rest, many of whom returned to their own families via the train. Very few teachers had a college education back then. Most acquired a teaching certificate which required at least one year of education beyond high school. Most were women although Longrie did have one male teacher. Longrie school is unique in itself in that it is one of the few one-room schools to have all the classroom windows located on one side. Most schools had windows along both sides. The reason is that in the later 1920's educators feared that poor lighting was creating eye problems in the children. They thought the solution at the time was to have the natural light come over the left shoulder of the student. That is likely why when the second Longrie school was built they incorporated the latest design elements of the time into construction and as a result located the windows on only one side. Unfortunately, little consideration was given to any left-handed students. Natural light was further supplemented with electric lights but that didn't happen until the 1930's. Kerosene lanterns were used before then. Early bathrooms were quite different from today as well. The first school at Longrie had both a 'girls' and 'boys' bathroom outside and behind the school. These were called outhouses or privies. When the second school was built they removed the old outhouses and again incorporated the latest design elements of the time and installed new, chemical toilets inside the school. Periodically, chemicals were added to hasten 'the process' and the tanks would need to be cleaned out from time to time. It was often said these didn't work out quite as well as intended. Most kids walked to school. Some found short-cuts through the wood and still others had to go a different way to avoid a farmer's mean bull. Some hiked to school from as far away as three miles while others were lucky enough to simply run across the road. In later years many were bussed to school. Recess was then, as it is today. The kids played baseball and 'ante-over' in the summer and fox & geese and snowballs in the winter. They also pumped well water into a trough that they formed with packed snow. The water would freeze providing a nice slide to which a running start would add the finishing touch. In the late 1950's and early 1960's schools were consolidating to save money. It was also thought that consolidation would lead to better education. So in the early 1960's Longrie School and several other one-room schools consolidated with the bigger school in nearby Stephenson, Michigan. This forever ended classes at Longrie School as well as many other one room schools that dotted the area. Although its function as a school was over, the old Longrie one-room school building would serve the township and community for many years after as a Senior Citizens Civic Club center. Today Longrie School sits idle, a ghostly reminder of a little thriving community that once was. Gone are the children, the railroad, and the simple times of yesteryear. August, 1924 - John S. Frederiksen has the misfortune of having his hand badly injured at the Koss mill last Friday. June, 1927 - Miss Harriet Hallfrisch is visiting with her sister, Miss Francis at Lake Linden. June, 1937 - Miss Joyce Wood, student nurse at the Milwaukee County hospital arrived Friday for a three week's visit with her parents, Mr. and Mrs. Alexander Wood in Lake township. August, 1938 - Albert Palmer harvested his grain with a combine one of the 1st machines to enter a field of grain in this part of the country. March, 1933 - The roof of the George Schanstine home of Koss caught fire on day last week but was extinguished by neighbors who formed a bucket brigade. September 19, 1914 - Joseph Foley has secured the contract to build the new town hall for Lake township. The building will be a frame one, covered with iron. April 15, 1932 - Edgar Hayward broke his arm last Friday playing ball. When he threw the ball his arm broke and he was immediately taken to the doctor and later taken to his home. May 25, 1951 - The Longrie school pupils and their teacher, Miss Sarah Campbell and their parents are holding their annual school picnic at Shakey Lakes today. December, 1958 - About 20 boys and girls and about a dozen parents met at the Longrie School Friday evening for the purpose of combining the local 4-H Clubs into one Community Club. The name, "Longrie Busy Buddies" was selected for the group. September, 1928 - Lake Township is to have a new hall. John Hallfrisch, supervisor, being the lowest bidder, received the contract to erect the new one. It will be located in the Longrie district. June, 1933 - Geo. Desjarlies of West Daggett is trucking timber to Haywards Mill. September 15, 1924 - Robert Scheffler and Gerome Alberti each took a load of wood to Stephenson, Tuesday. August, 1949 - Mr & Mrs Ernest LaValley and family are now living on the Glenn Hallfrisch farm. Mr & Mrs Harvey Kasbohm and family who formerly lived there have moved to Stephenson. June 2, 1939 - Mrs Earl DeMille of Longrie fractured several ribs when she fell from a step ladder while washing windows early last week. Mrs DeMille will be confined to her home for some time. July 28, 1939 - Mr & Mrs Robert Kruhmin son Bobby and daughter Selma and Mildred, and Mr & Mrs Simon Sager and daughter Lydia attended the Farmer's Union picnic at Waucedah, Sunday. November 2, 1934 - We had no school here Tuesday on account of some mischiefs person had broken in and enter the Longrie school and done so much damage that it was a shame, on Monday night this all happened. November 29, 1940 - Earl DeMille who injured his back while employed at the White House Milk Company in Stephenson on Monday, was a caller here (Palestine) on that day. May 9, 1924 - There will be a Basket social at the Longrie School No. 5, Lake Township, on Wednesday night May 14. Everybody welcome. Bring your baskets. Eight o'clock. June 8, 1918 - Mr Sager had a field of sugar beets planted but the seeds failed to grow, so he is busy replanting new seeds. May 25, 1949 - Daughter Born; Mr & Mrs Elmer Busick, a daughter, thursday, May 12, at the Daggett Maternity Home. She will be named Beverly Jo. August 24, 1934 - Melvin Sundbeck killed a large snake Monday measuring 59 inches from head to the tip of its tail. March 22, 1935 - Kruhmins are living in the Gravel's log building at the Longrie crossing. November 11, 1941 - Paul Palmer returned Monday to Texas after a few days visit with his father, H.R. Palmer. February 13, 1942 - SHS Junior Views - Jack Hanson of the Public Speaking Class gave a very fine speech in our home room. The topic of his speech was "Freedom of Speech & Press". His talk was enjoyed very much by our class. May 15, 1942 - Forrest Whitaker, infant son of Mr & Mrs Barney Whitaker, burned his hand on a stove Thursday. August 3, 1918 - Longrie Items; Howard Goodman is expected home this week from the Navy to visit friends and relatives. July 17, 1942 - Births; Philo- Mr. and Mrs. Lorn Philo, Harris are the parents of a girl, born July 12th. The little girl's name is Beverly Marie. May 16, 1958 - Longrie, Eileen Kruhmin, Susan Palmer, Clara Busick and Tony Swanson who will be kindergarten students next year, attended Longrie school on Monday to give them an idea of what school will be like next year. May 23, 1943 - 4-H Members Win County Honors; Cotton III-Betty Ann Harris and Handicraft, 2nd Yr.-Wm. Trehey. July 16, 1943 - Rupert DeMille who was honorably discharged from the army returned to his farm home in Lake Township. December 3, 1943 - News of Those In Service: Alfred Palmer, Aviation Cadet returned to Ft. Sheridan, Thursday after a visit at his home here. He will leave later for Keesler Field, Miss. February 16, 1945 - Miss Frances Hallfrisch, laboratory technician at McCloskey Hospital of Temple, TX arrived home Monday to visit with her parents, Mr & Mrs John Hallfrisch for a week. June 8, 1951 - Elmer Busick Jr., 3-year old son of Mr & Mrs Elmer Busick fractured his left elbow on Sunday when he fell from the granary at their farm home. October 31, 1958 - Longrie, Men of the Longrie Parent-Teacher Club met Saturday afternoon and moved the playground equipment from the Kells school to the Longrie school. The children who formerly attended the Kells school are now attending Longrie school. July 10, 1959 - Mrs. Steven Feher and son Joseph left Tuesday night aboard North Central Air Lines to spend a month with Mrs. Feher's parents in Miami, Florida. November 24, 1964 - Longrie, A large group of friends and neighbors gathered at the Edmund Sager home Sunday to pour a concrete ceiling on the potato warehouse.